Sorry, but this will be brief – profound changes going on, and I have to give myself time, space and energy to process. So, consider this a “hot tease” for what will follow. Stanzin said she knew of more suitable caves. We traveled a few kilometers further up the Douk River, and found VERY suitable caves — an ancient abandoned temple. Only slight problem: over 100 feet straight up a sheer cliff wall! Stanzin and her friends scampered up like mountain goats. I followed… like a person very comfortable with computers. 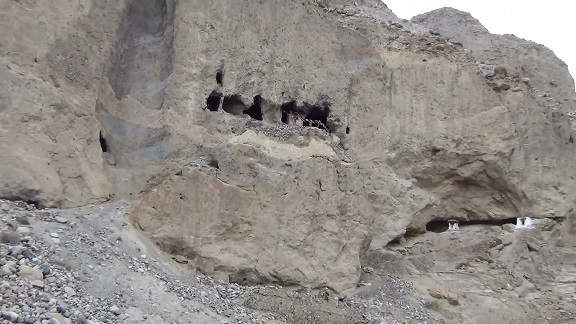 We (meaning they) got my food, water and equipment unloaded and carried up the cliff (borrowed sleeping bag and pad, 13 bottles of water, 30 boiled eggs, and “sam-path”, a barley flour that the Ladakhi herdsmen use as a staple. (For the cave experience, I carried NO digital devices (except my camera). Even took off my 24 time zone, global chronograph (others call it a “watch”) Nor did I carry any reading material). Then, I watched my friends return to the vehicle and drive away – The only 3 people in the world who knew my whereabouts… and two did not speak English. It was a very emotional moment. It was impossible to tell how many years/decades/centuries the temple had been abandoned. Over the years, people had climbed up, scratched their names into the walls, and left. I started by cleaning the floors and altar space of accumulated grit, grime and debris. Hands and knees work. Felt good. Then, I tried to repair some of the rock steps that graced the path. Not so lucky. I didn’t have the talent of placing the stones so they wouldn’t come loose the first time someone tried to use them as stairs (namely, me). Finally, I hung my first string of prayer flags. Not an easy thing. I had to crawl within 6 inches of the cliff drop, to attach the strings of flags (two hands, no holding on), then crawl back and find a way to anchor them. I did not eat, for some reason. My sleeping and waking blended and blurred. On the morning of the third day, with my “gifts” firmly in hand/mind/Heart, I bounded out of my sleeping bag… and promptly passed out, striking my head on the altar. A good sign of the “spirit is willing, but the energy is weak”. Going down the cliff took me 20 minutes… before, it had taken Stanzin 30 seconds, actually HOPPING from boulder to boulder, with a 100 foot drop just inches away. Stanzin had given me permission to throw her sleeping bag over the side – it wouldn’t hurt it, and gave me one less thing to carry. When I did it, I had no idea it would bounce that hard or go that far. I was whooping and yelling “hole in one!” when I remembered – that’s exactly what I will look like, if I don’t pay attention and get my act together. So, slowly, step by step, I came down the cliff. At several points, my trekking poles sank into nothing but loose sand, which poured over the rocks in the direction I did NOT want to go. Once I got down the cliff, I still had to negotiate the boulder field. You would think that was easy… it’s not. When they were depositing me, our driver fell twice – and it was the boulder field, not the cliff, that tripped him up. So… it wasn’t Jesus’ 40 days and nights in the wilderness, but Jesus didn’t have a plane to catch next week. 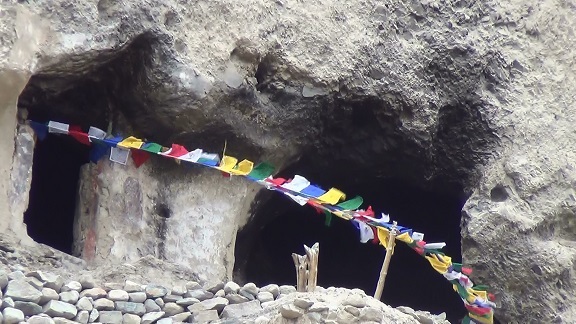 Entrance to the Temple of Tara (left), with YOUR prayer flags flying! And the revelations… will be the subject of another article. 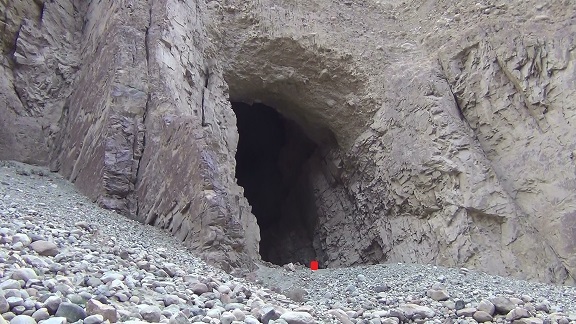 (Also coming: a video tour of the insides of the cave. soory,i didn,t got indian visa. your journey seems great.sabu oracle says you found shamanic roots .haleluaaaaaaaaaaaa. I feel like I’ve received a gift. You are generous in your sharing of such a personal experience. But that is one of the reasons you are here. I am profoundly touched. Thank you! You are well, you are secure, you are happy. Even out of breath you are these. These come through your river of words. Floating like a canoe in white water. The privilege of being on this end of your journey is also profound. There was a sense of release and relief when it was Tara whose arms you fell into. Many more blessings on your journey! Thank you for a glimpse of your journey. Yep, it’s inspirational as are you! What an experience–to experience yourself as FREE! To break free of all the excuses and justifications and “why you can’ts” and go for LIFE in the biggest way! I can hardly wait to hear more. My heart goes out to you, Sharif. I look forward to hearing more when you’ve had a chance to integrate your experience. Jai Jai Sri Ma! Om Sri Tara! Metta metta metta to Sharif! Well done, Sharif! Tara, or Quan Yin, – the Mother of Life – would surely have been my first choice, as well. Surrendering, allowing, devoted to Divine Will and offering up Self in response as Form, yet beyond both Will and Form. Pure Essence. Eternal. “Before” both Will and Form, which of necessity spring from Her simultaneously. That which remains when all else comes to the conclusion of Its sacred journey. We look forward to receiving you. Until then, be well. Be well, be secure and be happy. The Temple of Tara is beautiful. Thank you for sharing. I know more is to come. Goddess of compassion. How wonderful. I call that “Divine Inspiration” exactly right. Beautiful account of a life evolving event. Much love sent your way as you continue on your quest.